The great and good welfare state. A report by MPs last month found that six million Brits are living in homes where no one works and benefits have become a way of life. The Sun previously revealed 101,000 people get sickness benefits because they are drug addicts or alcoholics — more than double the number ten years ago. What 'social inclusion and participation' looks like. Under National, funding to hospices will be significantly increased. John Key promised this yesterday. Pause. Remember that just recently the government foisted on an unwilling (understatement) public the anti smacking law. They were aided and abetted in this by organisations who work with children like Barnardos, Plunket, Save the Children - all of whom receive government funding and constantly lobby for more. Their advocacy machines worked overtime trying to convince the public of the necessity and desirability of this most unpopular legislation. The issue should have been a conscience vote but the ruling government forbade its MPs from exercising that option. Fast forward to a time when institutions working with the terminally ill are largely government funded. The Death With Dignity bill is back in the house. The government of the day wants it passed. You can see where I am going with this. I am in favour of voluntary euthanasia but legislation must never be subjected to the kind of in-the-government's-pocket lobbying the anti-smacking law saw. My advice to hospices is to retain their independence by relying on private fund-raising as much as possible. My conjecture is an ugly, and some will say unthinkable scenario, but I am less sure. "Were it not for the significant investment in enforcement and education targeting drink-driving, the figures would be much worse," he said. Of course the above statement can never be proved or disproved. So once set in motion 'education' programmes that spend taxpayer money are almost impossible to get rid of. There are too many interested parties. It's similar to the anti-family violence campaign. Violence is going up but that's good. The campaign is working. More people are reporting violence. If violence starts going down, then that's good. The campaign is working. National touting for Maori Party Votes? Now the claimant is hardly reliable but somebody else must be able to confirm this. Hekia Parata, standing in Mana, is asking people to give their party vote to the Maori Party according to Winston Peters. If so, isn't it saying something that National would rather deal with the Maori Party and their fantastic policy planks, than ACT? "If I can't trust Winz who else can I turn to for support?" How tragically pathetic. The speaker is a Maori girl who doesn't look more than twenty. She buried her last baby after its death from SIDS and she has a one year-old and five year-old she can't afford to feed. Where is the whanau? That all-famous, all-loving extended family? Somewhere, I suspect, because she sent the kids "away for the school holidays". Is there a father or fathers of her children she can turn to? Quite probably not. Lame ducks no doubt. Look, I'm not angry about the taxpayer having to support this girl. That comes a long second. I am angry at the bloody stupid institutionalised practice of letting young women, a majority of them Maori, make their own situations progressively harder. This kid looks like a baby herself. Yes, she makes stupid decisions; yes, she gets used by men not prepared to make an iota of commitment to her because the so-called safety net let's them off the hook. They can play at life, making babies they don't really want and shooting through. This is the face of lifestyle welfare. And it is not a happy or unusual one. Last year 5,277 babies were added to an existing benefit. Think on that. Work and Income deputy chief executive Patricia Reade said .... the agency would make sure Ms Kihi received all the support it could give. "I am devastated that this has happened and that Ms Kihi had to go through such an appalling ordeal. I am deeply sorry we got it so very wrong." Work and Income does get it very wrong but not in the way Ms Reade thinks. Thanks to you all for continuing to read this blog. 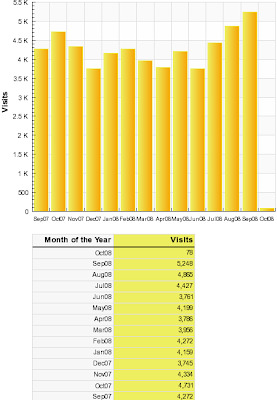 Last month visits went over 5,000 for the first time! Building blog readership is a hard road but I guess it's a bit like losing weight. If you do it gradually the results are more secure. And at least the overall trend is in the right direction. Go here to tell TV3 what you think about them kowtowing to Clark and Key. Borrow my message if you haven't the time to write your own. Tell Clark and Key you will not give them airtime if they refuse to participate in a debate with the leaders of other minor parties. Don't let them run the show. This is exactly why New Zealanders voted for MMP. Because they wanted the diversity and representation that the two main parties couldn't deliver. Stand up to Clark and Key and make it known you are. Who knows what it would do for your reputation and ratings. Show us why private ownership in the media is so important. The good judge speaks out again. Principal Youth Court judge Andrew Becroft makes an occasional habit of grabbing some headlines. But this is a departure from his usual message. Is violent offending by under 17 year olds increasing? "Violent offending is increasing. There has always been severe violence, but it is hard to get an accurate picture. We need to have much better statistics from the Ministry of Justice. We need to know [what is happening] early and the extent it's happening." He is complaining about the lack of information from a government department. This was at the heart of a conversation I was having with a friend last evening as we prepared to listen to an address by David Parker, Minister of State Services, about (and to) the public service. I have appealed to the Ombudsman twice over the past three years (to no avail) because requests previously met under the Official Information Act have been denied. Parker referred to the OIA saying that it "put a curb on a lack of transparency" but then in a more jocular fashion quipped that it was something of a "curse" because it meant "a lot more work" for departments. Well, no, actually. It doesn't mean a lot of work because the common response is a refusal to generate the requested information under section 18(g) or 18(f) which lets them off the hook. But, as my friend points out, we have paid for them to do exactly this through our taxes. I discern a distinct closing down on information release over the past three years. Yet Parker waxed lyrical about how independent, efficient, professional, accountable and transparent the public service is. There are, apparently, no "excesses". Oh really. According to the NZ Herald, In Wellington, the public sector workforce leapt from 11,940 in 2000 to 18,530 last year. A 55 percent increase isn't excessive? Then Parker had the gall to claim that "The public service has grown at a slightly lower rate than the private sector as a whole." To put that into some kind of perspective the total number of people employed in NZ has grown from 1.88 in December 1999 to 2.17 million - 15 percent. It leaves one wondering, if New Zealanders are so delighted with their public services why has Labour failed to cement itself as the natural party of government? That was their overriding ambition. To become like the Social Democrats of Sweden which has held power for most of the last 70 years. Looks like the damned public just don't appreciate the swag of public servants trying to run their lives for them. Even the judiciary is seeing fit to criticise their performance. Sue Bradford has confirmed parents will not be able to smack their children after her bill is passed. When questioned again today about the effect it would have on parents, she was asked whether it would be possible to smack children after her bill becomes law - and she said no.....she says it is *already illegal to smack children* but her bill removes a defence of reasonable force for the purpose of correction. Today's Herald poll on attitudes to the Section 59 law change shows just how confused next year's referendum question is, Green Party Children's Issues Spokesperson Sue Bradford says. It is no wonder the pulic is confused. It isn't the proponents of the referendum's fault. The woman is impossible. Large rise in child maltreatment deaths? 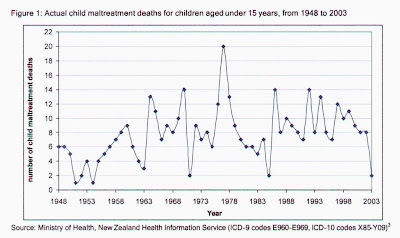 I used this graph recently to discuss the claim that the economic reforms had caused an increase in child deaths from maltreatment. Unfortunately I didn't have statistics post 2003 although Family First has claimed there have been around 7 deaths per year over recent years which sounds plausible. Of 88 children killed between 2002 and 2006, 48 were Pakeha, 28 were Maori and the remainder were Pacific Island and Asian. Do the maths. That would mean child deaths averaged 17.6 per year over that five year period. Far higher than any earlier period. I will attempt to find the source of these statistics but as the article was about the Children's Commissioner I would expect her office is the source. It is possible the figures include young people (over 14) as well as children (14 and under) but this wouldn't make a great deal of difference as child deaths are clustered in the younger ages. Perhaps police data differs substantially from NZHIS. Last Sunday morning we woke to find David's car had been broken into, along with five others in the street. This is our third experience of vehicle break-ins/theft/vandalism since we have lived in what is a dead-end street. It's bloody annoying having the car out of commission for a week while glass is ordered in. The local cop came but little can be done, as we have come to expect. Anyway the episode hadn't prompted me to write a blog post until today. One week later I am running Robert out early to Plimmerton in my car. Along the Esplanade in Petone, which has a 50km speed limit even at the industrial end, a cop is pointing his speed gun thingy at traffic and offending cars were being pulled up and ticketed by another three cops about 100 metres on. I wasn't stopped but my blood started boiling as I considered that 4 cops were being paid to harass citizens out and about on a quiet Sunday morning doing nothing more 'criminal' than going a few kilometres over a speed limit which is already too low. Now I am a simple person. But it strikes me that these taxpayer-funded agents of the state could be far better utilised patrolling the streets in the small hours of the morning attempting to detect but more importantly, DETER, real criminals. Or are they too afraid to do some real policing?